Acupressure (acupuncture + pressure) is an alternative medicine technique derived from acupuncture. Here, physical pressure is applied to acupuncture points by the elbow, hand, or with various devices. There are literally thousands of acupressure points on the body. Many of the problems encountered in dental clinics can be curbed using these pressure techniques very easily and it is not an invasive process like acupuncture. The article provides a review of pressure techniques and its use (focusing on gaging, dental anxiety, and temporomandibular joint pain) in orthodontic as well as any other dental setup. Keywords: Acupressure; orthodontics; painless technique. Acupuncture (Zhēn Jiŭ) means “to puncture with a needle.” The term acupuncture comprised two different words from Latin: Acus means needle and puncture means insertion. Traditional Chinese Medicine (TCM) defines acupuncture as, the stimulation of certain points on and/or near the surface of the body through any technique of point stimulation with/without the insertion of needles, which include the use of electrical, magnetic, light, and sound energy and cupping, to stabilize physiologic functions or to treat certain conditions of the human body. The puncture technique originated in China around 3000 years ago and involves insertion of needles into different parts of the body with the intention of curing disease. With time, the puncture is replaced by pressure but the points remain the same. Blom et al. have demonstrated its value in Sjøgren's disease. A commonly held view of acupressure technique is that it is a complicated technique which involves a substantial knowledge of age-old Chinese philosophy whose action is mainly a placebo effect and has limited application to dentistry. However, Richardson and Vincent  have demonstrated it to be effective in a wide range of musculoskeletal conditions, Lundeberg  has shown that it may improve the immune response, and Tao recommends its use in stress management, a topic that interfaces with dental practice. The oldest account is found in a book called Nei Jing which means the Yellow Emperor's Classic of Internal Medicine. Book's content dates somewhere around 200 BC. Some believes that some soldiers wounded in a battle by the arrows were cured of chronic afflictions that were otherwise untreated, and there are variations on this idea, hieroglyphs and pictographs have been found dating back from the Shang Dynasty (1600-1100 Before Common Era), which suggests that it was practiced along with moxibustion. The art originated in China and soon spread to Japan, the Korean peninsula, and elsewhere in Asia. In 1979, the World Health Organization (WHO) endorsed its use to treat 43 symptoms, which was later discussed by Wong. In 1996, this was extended to 64 conditions. In the report of Geneva WHO 2003, pain in dentistry (including temporomandibular dysfunction and dental pain), postoperative pain, and facial pain were listed among the conditions for which it has been proven to be successful through controlled experiments, to be an effective treatment. In dentistry, the ability of pressure technique has been proven for managing numerous chronic orofacial disorders. There are various reports of randomized controlled trials (RCTs) on the analgesic effect of acupuncture for postoperative pain caused by different dental procedures and by other chronic disorders. According to the literature, it is more effective than a placebo. Thus, acupressure can be considered as a sensible alternative and/or supplement to present dental practice, both as an analgesic and for addressing different dental disorders. Paresthesia or anesthesia of the oral and paraoral structures. There is a complicated network of nerve fibers in the dental pulp within the tooth and the periodontium surrounding it, and pain is triggered quickly when stimuli activate these nerve endings. Managing dental pain includes identifying and eliminating the etiological factors (such as caries, gingivitis, and/or periodontitis), followed by prescribing or administering analgesic medication, if required. The role of acupressure in dental pain may not involve eradicating the cause of the pain, but rather serving as an adjunct in achieving pain relief. The National Institutes of Health Concord Statement on Acupuncture and Acupressure of November of 1998 states that promising results have been shown for postoperative dental pain. A systematic review by Ernst and Pittler assessed the effectiveness for treating acute dental pain. This review contains 16 controlled trials, most of which implied that it was effective in dental analgesia. The reviewers concluded that technique could alleviate dental pain. Chapman et al. stated that the tooth pain threshold to electrical stimulation was significantly raised. It may help relieve dental pain by  stimulating the nerves located in muscles, which results into release of endorphins and other neurohumoral factors (e.g., neuropeptide Y, serotonin). Increasing local microcirculation, which helps disperse swelling. There are various acupressure points for relieving toothaches and the pain associated with gum disease. Working on these points can help get better quickly. We do not have to use all of these points. Using just one or two of them whenever you have a free time can be effective. Location: At the bottom of the cheekbone, situated directly below the pupil. Benefits: Relieves head congestion, toothaches, and sinus pain. Location: In between upper and lower jaws, on the muscle that bulges in front of the earlobe when the back teeth are slightly clenched. Benefits: Relieves jaw pain and spasm, lockjaw, TMJ problems, dental neuralgia, and toothaches. 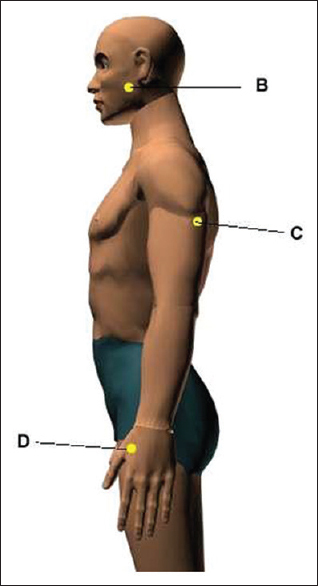 Location: On the outer surface of the upper arm, one thumb width in back of the base of the deltoid muscle and two finger widths higher up toward the shoulder. Benefits: Relieves toothaches, shoulder pain, elbow pain, and painful arm extension. Caution: This point is forbidden for pregnant women as its stimulation can evoke premature contractions in the uterus. Location: Between the webbing of the thumb and index finger at the muscle when the two are brought close together. Benefits: Relieves toothaches and headaches; also traditionally used as a general pain reliever, decongestant, and anti-inflammatory point. The TMJ is the most complicated joint in our body. The TMJ is often predisposed to degenerative changes and pathologies as a result of frequent and repetitive stresses that the TMJ undergoes. Common symptoms associated with TMD includes pain in the TMJ, generalized orofacial pain, chronic headaches, jaw dysfunction, including hyper- and hypo-mobility, limited movement or jaw locking, painful clicking and/or popping sounds with opening or closing of the mouth, and difficulty in speaking or chewing. TMJ disorders are of following three categories: (1) Masticatory muscle disorder; (2) internal derangement; and (3) degenerative joint disease. While acupressure therapy may not be useful for removing the cause of TMD which results from structural anomalies, it mainly helps relieve the pain and discomfort associated with the conditions. It has been documented that it can help muscle relaxation and reduce muscle spasms, if the spasms are indeed muscular in origin. Several reports on the use of auricular acupressure for treating acute and chronic anxiety have shown promising results.,, There was no difference in the efficacy of auricular acupuncture and midazolam in the management of anxiety related to dental treatment. The stimulation of acupuncture points like PC6 Neiguan and CV24 [Figure 3] Chengjiang has proved to significantly reduce gag reflex  using pressure at these points. Reports suggest this technique to be helpful in treating severe gag reflex. The points which reduce anxiety are as follows: top inside of ear (relaxation), lower inside of ear, just where The lobe attached to the side of the face, and just near the upper part of the lobe (master cerebral). Stimulation of this point before undergoing treatment successfully controls the gag reflex, which allows a dentists to perform a variety of clinical methods without compromising the patient's safety and comfort. It is characterized by localized, hypersensitive myofascial trigger points. These trigger points may result from muscle overload from trauma and repetitive activities which cause abnormal stress on specific muscle groups. Clinically, patients complain of headaches, tenderness, restricted movement of jaws, muscle stiffness, and weakness. Park et al. took a more specific approach. A randomized clinical trial was performed by Shen et al. to evaluate the effectiveness of acupressure for myofascial pain of the jaw muscles. Twenty-eight patients aged >18 years, who were diagnosed with chronic myofascial pain of the jaw muscles, received the pressure therapy. General head and neck pain ratings were obtained both before and after treatment on a numerical scale. 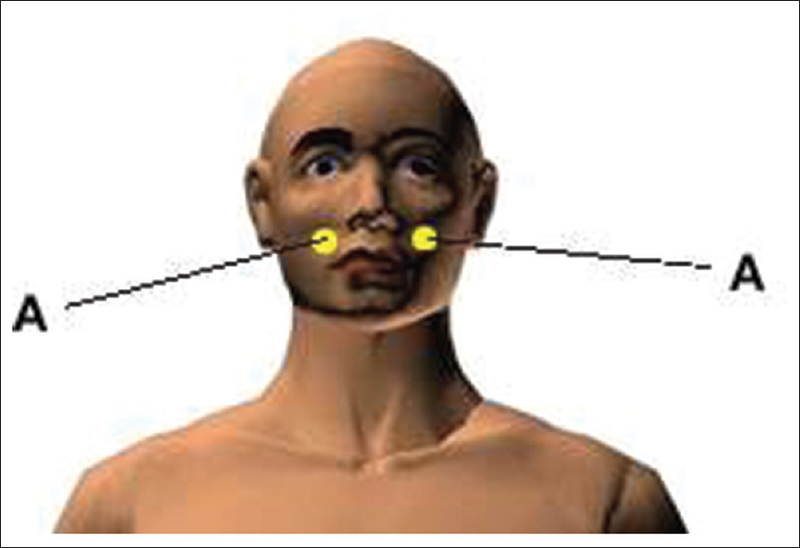 A mechanical pain stimulus on the masseter muscle was administered before and after the procedure and rated on a visual analog scale to measure pain-tolerance level. Patients who received verum acupuncture experienced a reduction in jaw pain, jaw/face tightness, and neck pain, and also had an increase in pain tolerance of the masseter muscle. Originally, the term atypical facial pain was coined to describe those patients whose response to neurosurgical procedures was “atypical.” The term has been used for various facial pain problems and represents a psychological disorder although no specific criteria for diagnosis have been established. Acupuncture is generally believed to stimulate the nervous system which causes the release of neurochemical messenger molecules. These biochemical changes monitor the body's homeostatic mechanisms and help in promoting physical and emotional well-being of patients. Stimulation of certain acupressure points affects areas of brain known to reduce sensitivity to pain and stress. Rohmetra A, Kulshrestha R, Singh K, Jaiswal A. Acupuncture therapy in orthodontics – A review. Eur Dent Forum 2016;1:20-4. Rosted P. Introduction to acupuncture in dentistry. Br Dent J 2000;189:136-40. Stux G, Pomeranz G. Scientific Basis of Acupuncture: Acupuncture Textbook and Atlas. Heidelberg: Springer Verlag; 1987. Blom M, Dawidson I, Angmar-Månsson B. The effect of acupuncture on salivary flow rates in patients with xerostomia. Oral Surg Oral Med Oral Pathol 1992;73:293-8. Richardson PH, Vincent CA. Acupuncture for the treatment of pain: A review of evaluative research. Pain 1986;24:15-40. Lundeberg T. Peripheral effects of sensory nerve stimulation (acupuncture) in inflammation and ischemia. Scand J Rehabil Med Suppl 1993;29:61-86. Tao DJ. Research on the reduction of anxiety and depression with acupuncture. Am J Acupunct 1993;21:327-9. Melzack R, Stillwell DM, Fox EJ. Trigger points and acupuncture points for pain: Correlations and implications. Pain 1977;3:3-23. White A, Ernst E. A Cupuncture: A Scientific Appraisal. Elsevier Health Sciences; 1999. p. 1. Robson T. An Introduction to Complementary Medicine. Allen and Unwin; 2004. p. 90. Prioreschi P. A History of Medicine. Vol. 2. Horatius Press; 2004. p. 147-8. Wong LB. Acupuncture in dentistry: Its possible role and application. Proc Singap Healthc 2012;21:432-48. Michalek-Sauberer A, Heinzl H, Sator-Katzenschlager SM, Monov G, Knolle E, Kress HG. Perioperative auricular electroacupuncture has no effect on pain and analgesic consumption after third molar tooth extraction. Anesth Analg 2007;104:542-7. Ekblom A, Hansson P, Thomsson M, Thomas M. Increased postoperative pain and consumption of analgesics following acupuncture. Pain 1991;44:241-7. Johansson A, Wenneberg B, Wagersten C, Haraldson T. Acupuncture in treatment of facial muscular pain. Acta Odontol Scand 1991;49:153-8. Lao L, Bergman S, Anderson R, Langenberg P, Wong RH, Berman B. The effect of acupuncture on post-operative oral surgery pain; a pilot study. Acupunct Med 1994;12:13-7. Lao L, Bergman S, Langenberg P, Wong RH, Berman B. Efficacy of Chinese acupuncture on postoperative oral surgery pain. Oral Surg Oral Med Oral Pathol Oral Radiol Endod 1995;79:423-8. List T, Helkimo M, Andersson S, Carlsson GE. 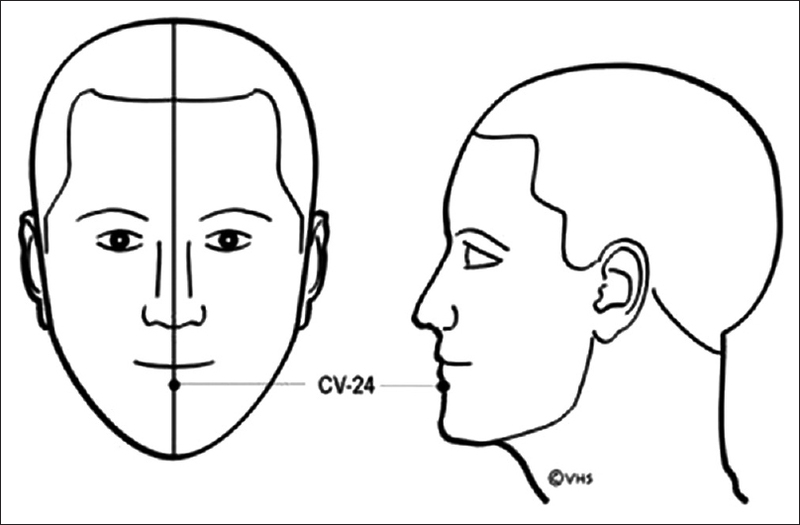 Acupuncture and occlusal splint therapy in the treatment of craniomandibular disorders. Part I. A comparative study. Swed Dent J 1992;16:125-41. List T, Helkimo M. Acupuncture and occlusal splint therapy in the treatment of craniomandibular disorders. II. A 1-year follow-up study. Acta Odontol Scand 1992;50:375-85. Raustia AM, Pohjola RT, Virtanen KK. Acupuncture compared with stomatognathic treatment for TMJ dysfunction. Part I: A randomized study. J Prosthet Dent 1985;54:581-5. Raustia AM, Pohjola RT, Virtanen KK. Acupuncture compared with stomatognathic treatment for TMJ dysfunction. Part II: Components of the dysfunction index. J Prosthet Dent 1986;55:372-6. Raustia AM, Pohjola RT. Acupuncture compared with stomatognathic treatment for TMJ dysfunction. Part III: Effect of treatment on mobility. J Prosthet Dent 1986;56:616-23. Sung YF, Kutner MH, Cerine FC, Frederickson EL. Comparison of the effects of acupuncture and codeine on postoperative dental pain. Anesth Analg 1977;56:473-8. Taub HA, Mitchell JN, Stuber FE, Eisenberg L, Beard MC, McCormack RK. Analgesia for operative dentistry: A comparison of acupuncture and placebo. Oral Surg Oral Med Oral Pathol 1979;48:205-10. Baraschkow GN, Stosch WI. The acupuncture as a medium of pain fighting for dental extractions. Acupuncture 1991;19:207-9. Hansson P, Ekblom A, Thomsson M, Lundeberg T. Is acupuncture sufficient as the sole analgesic in oral surgery? Oral Surg Oral Med Oral Pathol 1987;64:283-6. Lapeer GL, Biedermann HJ, Hemsted JJ. Acupuncture analgesia for postoperative dental pain. J Can Dent Assoc 1987;53:479-80. Lee MH, Teng P, Zaretsky HH, Rubin M. Acupuncture anesthesia in dentistry. A clinical investigation. N Y State Dent J 1973;39:299-301. Vickers A. Ensuring scientific rigor in literature review. Acupunct Med 1995;13:93-6. Naik PN, Kiran RA, Yalamanchal S, Kumar VA, Goli S, Vashist N. Acupuncture: An alternative therapy in dentistry and its possible applications. Med Acupunct 2014;26:308-314. NIH consensus conference. Acupuncture. JAMA 1998;280:1518-24. Chapman CR, Chen AC, Bonica JJ. Effects of intrasegmental electrical acupuncture on dental pain: Evaluation by threshold estimation and sensory decision theory. Pain 1977;3:213-27. Andersson S, Lundeberg T. Acupuncture – From empiricism to science: Functional background to acupuncture effects in pain and disease. Med Hypotheses 1995;45:271-81. Zijlstra FJ, van den Berg-de Lange I, Huygen FJ, Klein J. Anti-inflammatory actions of acupuncture. Mediators Inflamm 2003;12:59-69. Wang SM, Kain ZN. Auricular acupuncture: A potential treatment for anxiety. Anesth Analg 2001;92:548-53. Wang SM, Peloquin C, Kain ZN. The use of auricular acupuncture to reduce preoperative anxiety. Anesth Analg 2001;93:1178-80. Karst M, Winterhalter M, Münte S, Francki B, Hondronikos A, Eckardt A, et al. Auricular acupuncture for dental anxiety: A randomized controlled trial. Anesth Analg 2007;104:295-300. Rosted P, Bundgaard M, Fiske J, Pedersen AM. The use of acupuncture in controlling the gag reflex in patients requiring an upper alginate impression: An audit. Br Dent J 2006;201:721-5. Somri M, Vaida SJ, Sabo E, Yassain G, Gankin I, Gaitini LA. Acupuncture versus ondansetron in the prevention of postoperative vomiting. A study of children undergoing dental surgery. Anaesthesia 2001;56:927-32. List T. Acupuncture in the treatment of patients with craniomandibular disorders. Comparative, longitudinal and methodological studies. Swed Dent J Suppl 1992;87:1-159. Park J, White A, Stevinson C, Ernst E, James M. Validating a new non-penetrating sham acupuncture device: Two randomised controlled trials. Acupunct Med 2002;20:168-74. Shen YF, Younger J, Goddard G, Mackey S. Randomized clinical trial of acupuncture for myofascial pain of the jaw muscles. J Orofac Pain 2009;23:353-9. Cho SH, Whang WW. Acupuncture for temporomandibular disorders: A systematic review. J Orofac Pain 2010;24:152-62. Johnstone PA, Peng YP, May BC, Inouye WS, Niemtzow RC. Acupuncture for pilocarpine-resistant xerostomia following radiotherapy for head and neck malignancies. Int J Radiat Oncol Biol Phys 2001;50:353-7. Furness S, Bryan G, McMillan R, Worthington HV. Interventions for the management of dry mouth: Non-pharmacological interventions. Cochrane Database Syst Rev 2013;2:CD009603. Rosted P. Adverse reaction after acupuncture: A review. Crit Rev Phys Rehabil Med 1997;9:245-64. Kadtane SS, Bhaskar DJ, Agali CR, Shah S, Malu A, Jadhav S. Perception about the role of dentists in smoking cessation: A cross-sectional study. Int J Dent Med Res 2014;1:2-7. Singh N, Jain A, Sinha N, Chauhan A, Rehman R. Application of four-handed dentistry in clinical practice: A review. Int J Dent Med Res 2014;1:8-13. Sahoo S, Sahoo SK. Herbal therapy: Emerging adjunct in medical practice. Int J Dent Med Res 2014;1:38-41. Gupta D, Nagar P, Karim B, Khan IM, Naveen B, Chaturvedi M, et al. Tobacco abuse amongst the school going students of 15 to 18 years of Almora district, Uttarakhand: A cross sectional study. Oral Health Dent Manag 2014;13:680-6.